Christopher Thomas, of Diabetic Rockstar fame, has a small but very admirable goal this Black Friday: to seek contributions of $1 to raise money for those working individuals without insurance to enable them to get affordable insulin and other diabetes supplies this year. He's calling it "Fight It Friday", and it's a very admirable goal, and one I am personally supporting, which is why I'm writing about it here. I've placed a donation widget here. But I sincerely hope he raises enough to remove all references to this very soon!! I'm Thankful for Hawaiian Punch Singles to Go! Occasionally, I cover some "new" products that may be of interest to people with diabetes. Although as of late I have taken a liking to Powerade Zero (a zero-calorie sports drink) as you may recall, a while back, I wrote about 4C Totally Light 2Go Drink Mix Just Apple flavor, and the 4C Apple flavor remains one of my favorites because I think it tastes just like apple juice (or at least what I remembered apple juice to taste like; its been decades since I've had real apple juice, which really does not deserve the label of a "healthy" beverage because it's a calorie-laden beverage that is no more healthy than Diet Coke Plus, which was reprimanded by the Fatalood & Drug Administration, see here fore details). Incidentally, Chrissie Engelbrecht in Belgium, although she's no longer actively blogging at Chrissie's Diabetes Blog anymore, remains a VERY active reader at Good Reads, so for those of you who followed her blog, you may want to join Good Reads and follow her there. I personally can't keep up with all the books she reads, but occasionally she posts photos of her new puppy, for example, so its also worth checking out. Anyway, today I'm going to address another, similar product to 4C Apple, this one being Hawaiian Punch® Singles to Go!, which is a similar to the 4C Apple ones noted above, in individual-sized powdered drink mix that can be mixed into any standard 16.9 oz. water bottle. Of course, those concerned about BPA in their water bottles can use them as a measurement only, if they like. Supposedly, the manufacturer, Jell Sert Corp. under license from the Dr. Pepper Snapple Group, Inc., also sells canisters in larger 2 quart sizes, although I have yet to find those offered at any retail stores near me. The reason I am thankful to see these products finally being offered is because when I was a kid with type 1 diabetes, I didn't have these things. Fortunately, kids diagnosed today won't have to endure the same kind of denial that I endured when I was diagnosed back in 1976 (not that it's all that much easier today, but at least they can still have Hawaiian Punch). 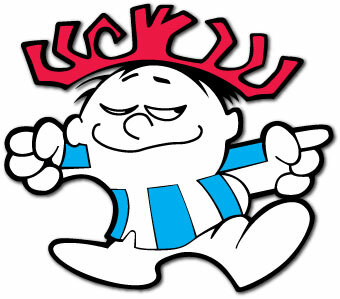 For me, part of the attraction of Hawaiian Punch is the fact that while all the other kids in the neighborhood got to slug Hawaiian Punch during the hot summer days, as a kid in the 1970's, I had the displeasure of having type 1 diabetes before the nation's diet craze kicked in and sugar-free anything remained pretty uncommon. About the only thing besides water that was around then was unflavored Kool-Aid packets, to which my parents could then add nasty-tasting Sweet & Low (saccharin) to for semi-sweetness. There were also a few (and only a few) diet sodas, including Coca Cola's Fresca, a grapefruit-flavored soda which has since been resurrected and is enjoying newfound popularity, and Tab (which is STILL AVAILABLE, believe it or not, yummy! ), but I grew up in a household where soda was only available as an occasional treat, not an everyday food. We also had a sugar-free gelatin at the time called D-Zerta, which was made by General Foods (a company my great grandfather had a hand in developing), today part of the U.S. food conglomerate Kraft, Inc., and has long since been replaced with Sugar-Free Jello, but back then, food companies were worried about brand erosion to their major brands, especially with artificial sweetners which carried dangerous-sounding warning labels on foods containing saccharin. Diabetic Foods that Caused Cancer? But in the early 1970's, there was actually an effort to ban artificial sweetners like saccharin. Throughout the 1960's, a number of different studies had suggested that saccharin might be an animal carcinogen. That concern peaked in 1977 (the year after I was diagnosed), after the publication of a study from The National Cancer Institute (NCI), an agency of the U.S. Department of Health and Human Services, found that laboratory rats fed large amounts of saccharin developed cancer. As a result, Congress (in it's infinite wisdom) mandated that further studies of saccharin be performed and required that all food containing saccharin beared the rather ominous-sounding warning label: "Use of this product may be hazardous to your health. This product contains saccharin, which has been determined to cause cancer in laboratory animals." When I asked my pediatrician at the time why all the "special" diabetic foods caused cancer, showing him the label of a package I had read, he responded by telling me not to worry about it. I was NOT comforted after seeing my grandmother die of cancer, even if he was correct in telling me not to worry about it. What can I say, I was a demanding child when it came to information! Only after these Congressionally-mandated studies wrapped up many years later did we learn that the basis for some of these inaccurate studies were files from the FDA's investigations of 1948 and 1949, which had originally argued against saccharin use, but were were later shown to prove almost nothing about saccharin being harmful to HUMAN health. The Congressionally-mandated studies which examined how a substance actually works in the body have shown that these results applied only to rats, thanks largely to how rodents metabolize sodium. But human epidemiology studies (studies of patterns, causes, and control of diseases in groups of people) have shown no consistent evidence that saccharin is associated with bladder cancer incidence. In 1991, after fourteen unnecessary years, the FDA formally withdrew its 1977 proposal to ban the use of saccharin, and in 2000, Congress finally repealed the law requiring saccharin products to carry health warning labels. Of course, by that time, the FDA approved aspartame, which tasted better, although that Monsanto-developed sweetner remains the subject of persistent adverse health claims even today, after Splenda has taken over as far as market share is concerned. Anyway, with that as a background, it's not hard to understand why almost no one in the food industry at that time dared recommending that artificial sweetners be used, especially for children (even those with diabetes). Today, there are all sorts conspiracy theories abound that it was prompted in large part by the influential U.S. sugar lobby, whom I wouldn't put it past, but evidence is hard to come by since lobbyists weren't tracked like they are today. Anyway, with that as my historical background, I should note that the Hawaiian Punch brand goes back a number of years, but at present, the brand and it's related characters such as "Punchy" (who was featured in TV commercials during the 1960's and 1970's) is owned by the Dr. Pepper Snapple Group, Inc., which is the beverage division that was spun off from what was formerly known as Cadbury Schweppes PLC before demerging in May 2008, thereby separating the global confectionery (mostly chocolates, now fending off an acquisition attempt by Kraft) business from the U.S. beverage unit. Dr. Pepper Snapple Group, Inc. has licensed the manufacture of Hawaiian Punch Singles to Jell Sert Corp., a privately-held, Chicago-based food company that has acquired a number of cast-off food brands, including Wylers drink mixes, My-T-Fine/Royal gelatins, and pudding mixes Flavor-Aid frozen treats just to name a few. 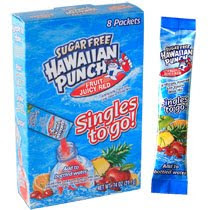 In 2003, the company signed licensing deals for the Hawaiian Punch and Snapple brands, and in early 2005, the first sugar-free Hawaiian Punch variety in the brand's history emerged (remember, the unsweetened variety was not "sugar-free", it was unsweetened). Hawaiian Punch Singles to Go! first launched on a nationwide basis a few years ago. I stumbled upon them in a Dollar store, only to not see them again for a few years. Today, however, a number of national retailers sell these products, including such retail giants as Wal-Mart Stores, Inc. and Walgreens Corp. just to name two. I have also seen them in major supermarket chains from California to Connecticut to Florida, so I know it's widely available. Although the drink is rather sweet (it's supposed to be a combination of seven natural fruits, including such tropical favorites as pineapple, passion fruit, papaya and guava) beverage, this variety contains zero carbs (see the Nutrition Facts here) and is an indulgence that even kids with diabetes can share! 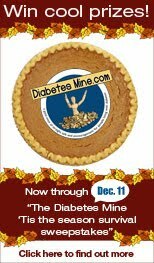 Beyond that, Amy Tenderich at DiabetesMine.com also kicked off her annual holiday contest. Amy's post, 'Tis the Season has all the details. There are some pretty cool prizes from Fit4D.com, HAH Originals, StickMeDesigns, Blue Bunny Ice Cream, and HealthiFeet, so check it out. What is the contest about? There are two main categories: The "Best Of" which asks people with diabetes (PWD) to share their triumphs and successes from their holiday seasons, and the "Worst Of" for which PWD's can share something that went totally wrong (which are probably more amusing to read about, but hopefully they can smile about these experiences now). Allison Blass & Scott K. Johnson have been invited to be judges in that contest, so please make sure there's some competition for the prizes, folks! Anyway, I may or may not do anymore posts this week, but I'll be back here, at the same bat channel, so be sure to have a great holiday and I'll catch up with everyone very soon! I remember the ads for that. My dad's mother used to use that, and what was that clear liquid sweetener? I don't remember much about the cyclamates brouhaha, but I do remember the saccharin thing. As I recall (and I was a Diet-Rite-Cola-swigging 15-year-old at the time), the amount of saccharin needed to produce cancer in the test rats was equal to that of 3000 cans of soda per day. Even if I've misremembered the details, the amount of exposure needed to produce toxicity was so ridiculously disproportionate to that of even excessive human consumption that I couldn't understand why the government would be as worried as it appeared to be. Thanks for the support Scott!!! !